This creamy, homemade low carb yogurt is delicious on its own, can be used as substitute for mayonnaise or sour cream in many recipes. Add fresh herbs for a tasty veggie dip or salad dressing. Strain your yogurt for a yogurt "cheese" that can be used in place of cream cheese. If you are on a low carb or Keto diet, this recipe will help you immensely in your journey. The Instant Pot will help you make yogurt, oh - so - easy. In fact, it is the *main* reason I purchased my Instant Pot - just for the yogurt setting. Making your own yogurt will pay for your Instant Pot in just a very short time. 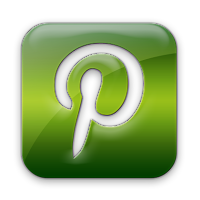 See how easy it is to make, right here! 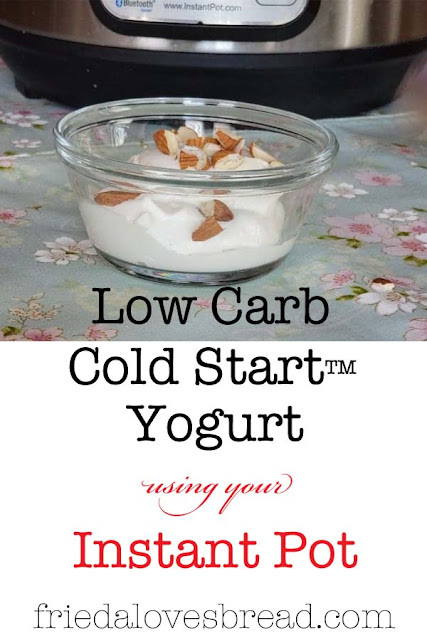 Why make your own low carb yogurt? 1. Diet & Control the Ingredients. You can avoid artificial sweeteners, additives and chemicals that are often in store bought yogurt to thicken, increase the shelf life and improve the flavor. (Check out the ingredients in the CarbMaster yogurt below). If you are sensitive to lactose, artificial sweeteners, or on a low carb diet, making your own yogurt makes sense. 2. Cost. Making your own yogurt can cost less, depending on where you live and how much milk costs in your area. Low carb, lactose free, and other specialty yogurts can cost much more. How does .39 cents per serving sound? 3. Reduce waste. You can store your own yogurt in reusable containers. Canning jars, plastic storage jars or even kid-friendly on-the-go pouches can be used. 4. Flavor. Making your own yogurt, has a fresh flavor, much unlike the "cooked" taste of store bought yogurt. You can control the level of tang by choosing your starter and incubation times. 5. Recipes. Use your homemade yogurt as a substitute for mayonnaise or sour cream in many recipes. Add herbs for a veggie dip. Make your own creamy vanilla frozen yogurt. Save some yogurt and freeze it for starters to make even more yummy yogurt! 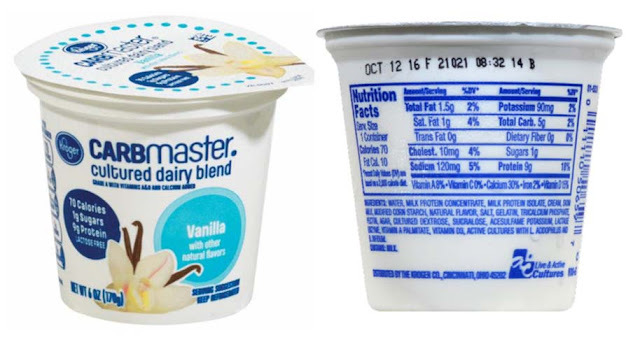 CarbMaster Yogurt Ingredients: Water, Milk Protein concentrate, Milk Protein isolate, cream, skim milk, modified corn starch, natural flavor, salt, gelatin, tricalcium phosphate, pectin, agar, cultured dextrose, sucralose, acesulfame potassium, lactase enzyme, vitamin A palmitate, Vitamin D3, Active cultures with L. Acidophilus and L.bifidum. Can I use the Traditional (boil) method with this recipe? Absolutely. You can use heavy whipping cream, half & half milk or any combination. Heat your milk, cool to 100°-110°F, add your starter and incubate from there. Traditional (boil) method. What if I don't have the yogurt setting? You can still make yogurt. Try this workaround. My best tip for this method is to wrap your pot of milk in a large towel, and put it in your oven with *only* the oven light on, to maintain the incubation temps. The milk with the lowest amount of carbs per cup is Heavy Whipping Cream, but it also has the most calories, at 800 per cup! The milk with the lowest calories per cup is Fairlife Fat Free milk, with only 80 calories per cup and 6 grams of carbs. You can find a lot more about Fairlife milk in my original Cold Start yogurt article. There are some store brands that are copycats of Fairlife: HEB MooTopia, Natrel Lactose Free, & Kroger CarbMaster. Lower fat milks have a higher water content and when used for making yogurt, ends up being fairly thin unless non fat milk powder is added or if the yogurt is strained. Straining yogurt concentrates the proteins, reduces the lactose, thickens your yogurt and reduces the yield. 1-2 tablespoons of your favorite plain or vanilla yogurt as your starter. The starter you use will have an impact on the taste and texture of your yogurt, so choose a starter that you like. If you like mild yogurt, try Fage or Oui yogurt as your starter. If you like more tang, try Siggis, Chobani or Greek Gods. Check here for more information on yogurt starters. My goal: Create the thickest, no strain yogurt, that tastes like OUI, with the lowest number of carbs. 5 grams of carbs? That is great! Less sugar, more protein, and fewer calories are a bonus! You may find store bought yogurt listing 3 or 4 grams per serving, but most often, the serving sizes are much smaller. In store bought yogurt, the carb count stabilizes around 4-5 grams per cup, as lactic acid produced (by the whey) continues to be made and the live bacteria become dormant. Tips for reducing the carb count even more! 1. Incubate your yogurt 15-24 hours. At this point, the friendly yogurt bacteria consume all the lactose. Keep in mind that the longer you incubate, the more tang you will develop in your yogurt. Increased whey separation is also common with longer incubation times. Most commercial yogurt does not ferment long enough at warm temperatures for the maximum consumption of lactose by the bacteria. Although fermentation continues after chilling, it is much slower. 2. Strain your yogurt. Straining yogurt removes liquid whey, which contains lactose (milk sugars). Not only does this thicken your yogurt, it increases the protein levels by concentrating it in your remaining yogurt. Straining your yogurt also makes it Greek style. The longer you strain, the thicker your yogurt will be, almost like cream cheese. Straining yogurt is simple, and this section of my IP Yogurt Guide for Newbies will give you some ideas how. 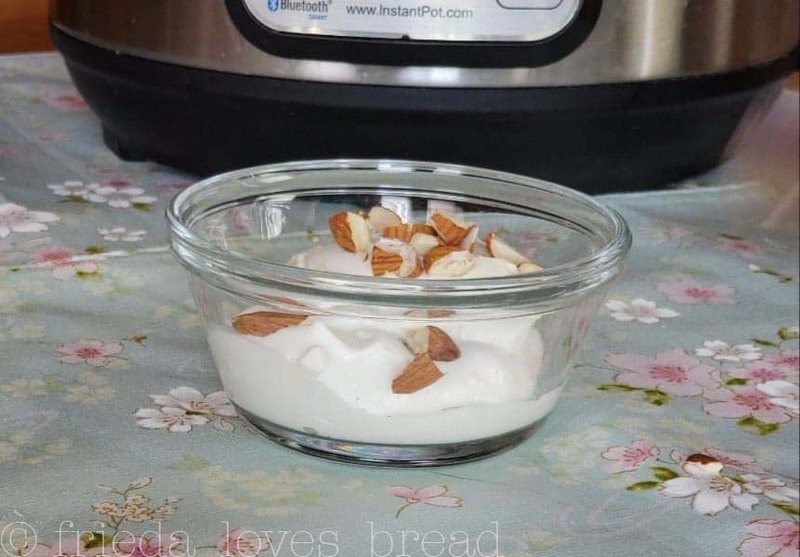 Make this very easy, creamy, low carb yogurt in your Instant Pot or yogurt maker! Choose an Ultra Pasteurized (UHT) filtered milk, half & half, heavy whipping cream or a combination for the lowest amount of carbs. You MUST use an ultra pasteurized or Ultra High Temp milk with this recipe. Flavor or sweeten as desired or use your plain yogurt as starters, a substitute for mayonnaise/sour cream in many recipes. Add fresh herbs to make a veggie dip or salad dressing. Strain very thick to make a yogurt "cheese" that can be substituted for cream cheese. 1. Make sure your Instant Pot & utensils are clean and free of any soap residue.2. Pour the contents of your milk & heavy whipping cream & yogurt starter into the pot insert, whisking well.3. Cover your Instant Pot with the lid & close the pressure valve. If your IP silicone seal is smelly, you may use a lid from your pots & pans, dinner plate, pie plate, or flat silicone suction lid.4. Select Yogurt Normal, according to your model. If you have the Ultra, this can be Medium or a customized setting in the 100°F-110°F range.5. Select the incubation time for 8 hours. You can choose a longer time, up to 24 hours, by pushing the (+) button for more tang to your yogurt.6. The IP will beep, and begin counting UP. When finished, the IP will beep and your display will show YOGT.7. Remove your pot of yogurt, cover with a paper towel and lid, and chill in the fridge for at least 4-6 hours. 8. If you want, you can transfer your yogurt to another container or strain by slowly pouring your yogurt - No stirring or scooping the yogurt until it has fully chilled. 9. After chilling, you can add your sweetener of choice and vanilla extract. I use 1 teaspoon of pure vanilla extract for this recipe. Save some plain, unflavored yogurt for starters or use a subs for mayo or sour cream. 10. Yogurt will keep for at least 2-3 weeks in the fridge. When frozen in tablespoon portions for starters, yogurt will remain viable for up to 6 months. Thaw starter at room temp for 30 minutes prior to mixing in with your milk. I was wondering, is the heavy cream also UHT? I am not a big yogurt fan because of the tartness. However, I am looking at this recipe and wondering, "How does it taste" and if I can enjoy this as a snack. Thanks for the information. 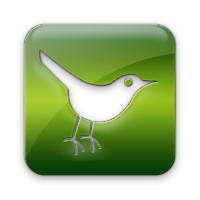 I am looking forward to trying it out! Hello, I just made this yogurt, after straining, which I got about 1 1/2 cups out, I was left with 36 or about 6ish cups. Is that right. When I entered all the ingredients in MFP, I did 10 servings, and got 141 cal. 5g carbs 9.4g fat and 8.5g protein. I'm not sure why mine is different from what you entered in. 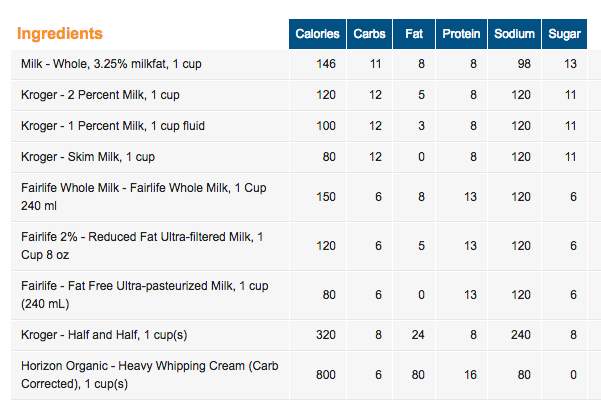 I did the whole carton of Fairlife milk, 1 cup HWC and I did 1 oz of the OUI yogurt since that is 2 tblsp. I'm confused. Straining reduces carbs and increases protein.